Spot the Manhattan Luxury Townhouse Lehman Effect? 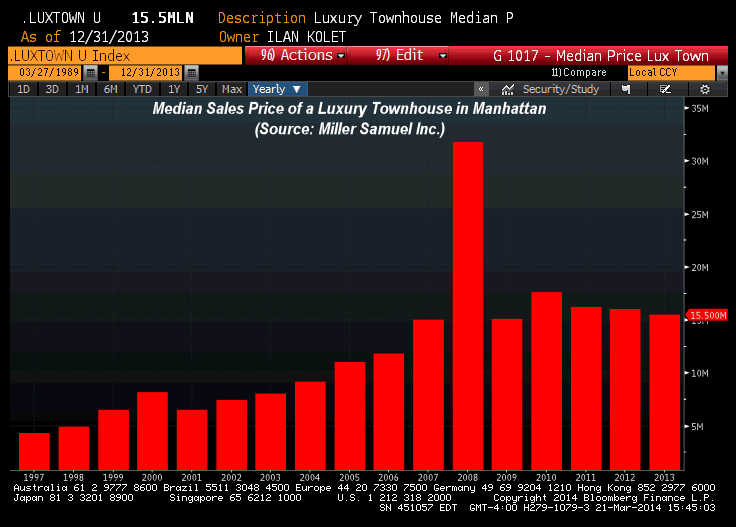 Ilan Kolet from Bloomberg News whipped up this chart and shared on twitter using our Manhattan luxury townhouse data. Gotta love the visual – the 2008 Lehman collapse exemplified in the high end townhouse market in the home of Wall Street. Comments Off on Spot the Manhattan Luxury Townhouse Lehman Effect? Had a great conversation with Trish Regan on her Bloomberg TV show “Street Smart” about the Manhattan and Brooklyn rental markets and rent versus buy. This was in connection with the February Elliman rental report we published earlier that day. It was windy and 18 degrees outside so I think I look a bit disheveled. But always fun to connect with everyone at Bloomberg whenever I visit (and maintain my Foursquare mayorship of the “green room”). 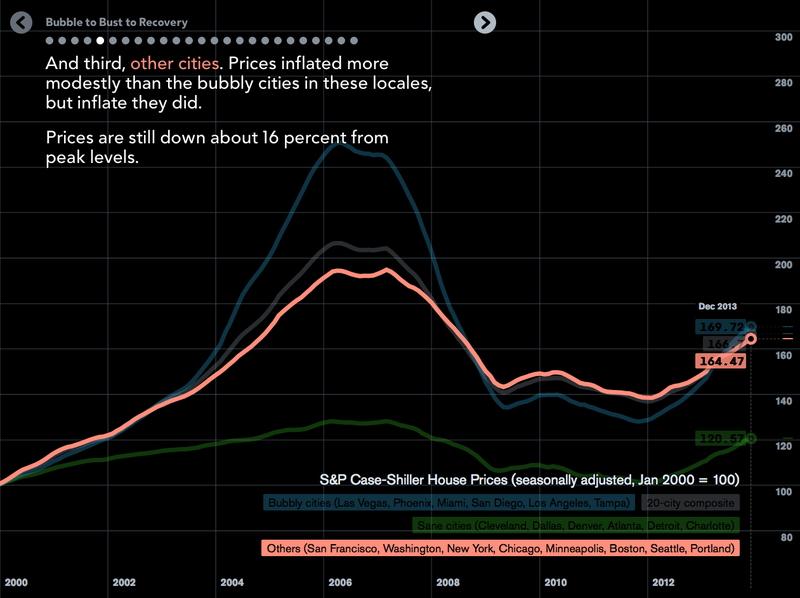 Is Housing Recovery Thwarted By The Polar Vortex? Since we have another cold snap in our midst, I thought I talk about cold weather and housing trends. Back in early January, the US experienced what has now become a household phrase – “The Polar Vortex” and extreme weather has morphed its way into recent housing reports as plausible explanations for a slow down in some of the results. Buyer perspective: Imagine a couple looking to buy their first home and decide they will begin looking right after the New Year. The dreaded Polar Vortex hits and it is too uncomfortable to run around looking at houses in freezing temperatures, so they postpone until the weather warms up in a month or 2. Seller perspective: Imagine a homeowner who decides to put their home on the market and they experience searing pain from the cold by simply going to the grocery store. They can’t imagine a buyer coming to look at their home in the severe weather and don’t want their home to sit, so they postpone until the weather warms up in a month or 2. WOW, this weather is severe. I’ve rethought my (buying or selling) decision and will cancel the idea for a few years because the weather is too cold right now. WOW, this weather is severe. Staying warm in my home right now made me realize that I rushed to make my decision and will no longer (buy or sell) for a long time. If we isolate the housing market to new construction (which represent about 15% of sales historically) then it gets a lot more plausible – ie permits, starts etc. can be more affected by the weather on a pragmatic basis. But that has little or no impact to the vast majority of housing consumers. 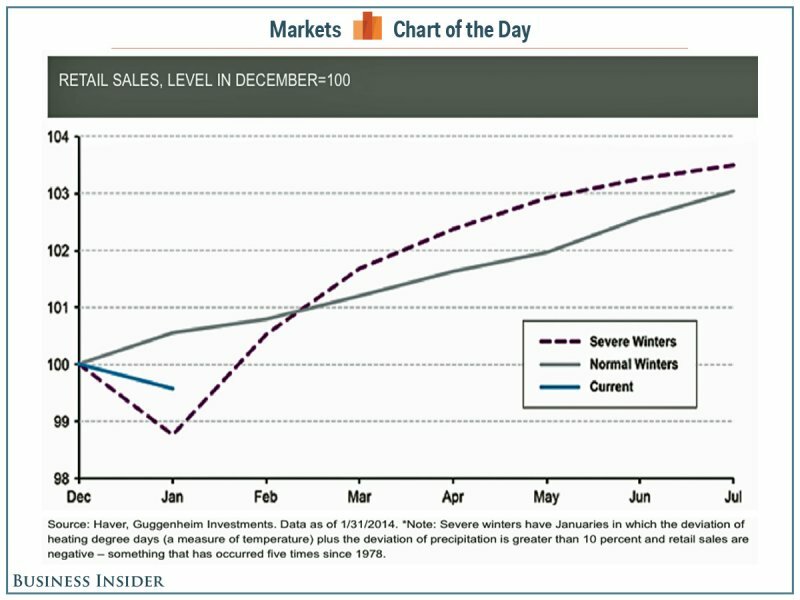 Here’s one way to visualize the potential impact of weather to retail sales activity (translation: slow down, spring back) in Business Insider. 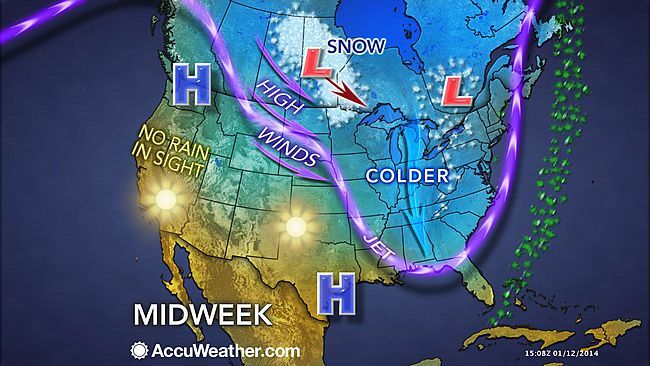 Comments Off on Is Housing Recovery Thwarted By The Polar Vortex? There was a terrific Bloomberg News story by Oshrat Carmiel: Manhattan Trophy Home Sellers Test Buyer Limits on Price that delved into the disconnect between reality and perception of the luxury housing market in Manhattan. I talk about this phenomenon on Bloomberg Radio’s ‘Taking Stock’ with Pimm Fox and Carol Masser. It all began with Sandy Weill’s $88M sale of 15 Central Park West PH20 to a Russian Oligarch back in late 2011 that closed in early 2012. He was reportedly purchasing the unit for his 20-something daughter to crash when she wasn’t at her home in Monaco but it was more likely a divorce strategy. The home sold for $13k per square foot, 30% more than the recent $10k ppsf record previously set within the building (ie definition of an outlier). Combine this outlier with the dearth of high end new development until recently and this 13k ppsf threshold became a new pricing tool for hopeful sellers and real estate brokers of large properties. The $100M resale penthouse listing at CitySpire was the new symbol of “outlier pricing” phenomenon. Other examples of aggressive pricing are cited in the Bloomberg story. Despite the fact that this nearly $100M subset represents a tiny sliver – a handful of listings and sales – in the overall Manhattan market, consumer (buyers and sellers) have been subjected to a buzz saw of news reports about trophy properties giving the impression that properties like this comprise most of the housing market. In reality there have only been a handful of contracts signed near the $100M threshold at buildings like One57 and 432 Park Avenue (the near $100M townhouse contract doesn’t count because it’s roughly 1/2 the ppsf of those apt sales)..and otherwise the overall Manhattan market seeing very modest price growth. Yet none of the trophy apartment resales are selling at this new price point. Sellers have been testing the waters to see if someone across the globe will be willing to pay for something here, that in relative dollars to their home market is a good deal or they hope they will get lucky and these buyers will over pay. Apparently these trophy sellers haven’t used the Internet. Just got this feedback emailed from a real estate agent: In every neighborhood and property class “testing the waters” is an age-old technique that has enough utility to go on forever. As an agent, I prefer the price that results in a quick sell but I never turned down a client who insists on an absurd Ask. In most such cases, I have picked up a few customers and sold them something else they could afford before the “outlier” ran out of inquiries and the seller dropped its price or took it off the market. I like it when journalists report activity at the extremes of price and value because it helps me to identify the evolving dimensions of the market. The median existing single-family home price increased in 73 percent of measured markets, with 119 out of 164 metropolitan statistical areas (MSAs) showing gains based on closings in the fourth quarter compared with the fourth quarter of 2012. Forty-two areas, 26 percent, had double-digit increases, two were unchanged and 43 recorded lower median prices. The storyline of the last 2 years has been “Housing is Back!” yet prices were rising based on fed policy, not due to fundamentals like income, employment and access to credit. I have been labeled as a bit bearish on the “recovery” but I’m really not. I look at this slow down as a good thing for the long view on housing. We need to have sustainable housing growth (ie sales and prices) and 13.7% YoY price gains are in start contrast to economic fundamentals. Here is an interview I recently did for Bloomberg Television’s In The Loop on the first phase of the long awaited and sorely needed Second Avenue subway line. I had also looked at this data about two years ago. For the show I crunched closed sales data for the 4th Quarter of 2013 versus the same period in 2009 and provided a similar time frame for the rental market. 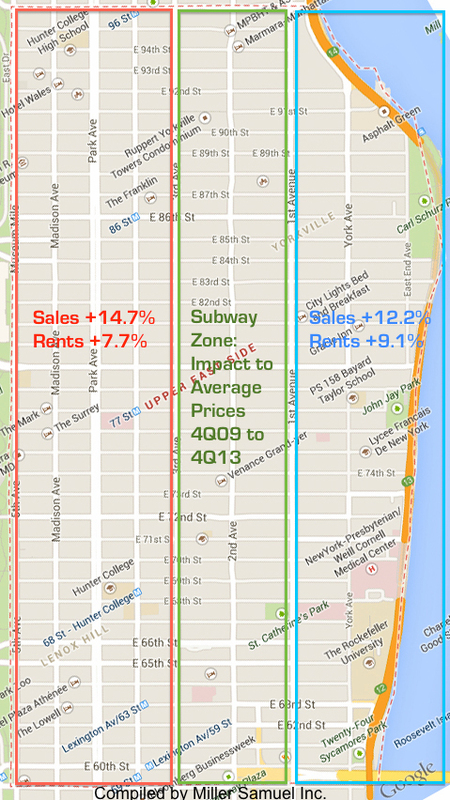 I defined the impacted subway zone as the Upper East Side neighborhood between Third Avenue and First Avenue extending from 96th Street to 59th Street. Areas out side the zone were simply those to the east and west of it but within the neighborhood. I realize that simply taking the average price of all transactions in each of the zones are subject to skew. However given the large size of the zones, I think it is a reasonable way to extract some sort of impact. Based on the results, the subway zone fell behind the areas outside the zone during the 4 year time span. I was reading my twitter feed and it just jumped out at me: Zillow announced their acquisition of StreetEasy for $50M in cash. I also heard it simultaneously on the show Bloomberg Surveillance. Their CEO Spencer Rascoff will be on the show tomorrow morning to talk about the acquisition. While there will be lots of prognosticating about Zillow‘s entrance into the NYC housing market through a heavily used resource like StreetEasy (Zillow was here already, just not taken very seriously). I think there’s a bigger story for Zillow. If Zillow leverages the StreetEasy data presentation model, Zillow will be shaking up the housing market real estate information space across the US. Think highrise urban housing markets – I call them “vertical” markets (not to be confused with “vertical” in marketing parlance). • All national data aggregators and brokerage companies haven’t yet figured out vertical housing markets yet in terms of their presentation of information. Kudos to Streeteasy for shaking up the market from day one. When they launched, StreetEasy became the housing data resource of choice for most in NYC. I met most of the team a while back and I was impressed with how a small group of people could really shake things up in a huge market. While presenting clean data in a very dirty data environment continues to be a challenge, I think their greatest contribution to the housing market has been how they displayed their information – in a way that consumers screamed for. Here are the 3 Manhattan luxury housing price indices we provide for the Bloomberg Terminals through 2Q 2013.